Earl Kim was born on January 6th, 1920, in Dinuba, California, the third son of immigrant Korean parents. He was educated at Los Angeles City College, the University of California-Los Angeles, and Harvard University. His principal teachers included Arnold Schoenberg, Ernest Bloch and Roger Sessions. He had a long and active career as a composer and teacher, and was James Edward Ditson Professor of Music, Emeritus, at Harvard University, where he taught from 1967 to 1990. Prior to his appointment at Harvard, he taught for 15 years at Princeton University. Throughout his career, Mr. Kim received considerable recognition as a composer, including commissions from the Fromm, Koussevitzky and Naumburg Foundations, from the University of Chicago and Boston University, from individuals and performing organizations; grants from the Ingram Merrill and Guggenheim Foundations and from the National Endowment for the Arts; and awards including the Prix de Paris, National Institute of Arts and Letters Award, Brandeis Creative Arts Medal and the Mark Horblitt Award of the Boston Symphony. Mr. Kim served terms as Composer-in-Residence at the Princeton Seminar in Advanced Musical Studies and at the Marlboro, Dartmouth, Tanglewood, Cape and Islands, and Aspen Music Festivals. In addition to his work as a composer and teacher, he was active as a pianist (including lieder recitals with Bethany Beardslee, Benita Valente and Dawn Upshaw), vocal coach and conductor, and was a co-founder and past president of Musicians Against Nuclear Arms. Mr. Kim is especially well-known for his extensive work in the idiom of music theatre, specifically on texts by Samuel Beckett. Representative works include Exercises en Route, which has been performed by artists such as Benita Valente, who has performed it throughout the United States in both its concert and theatre versions, and Narratives, premiered by Irene Worth and the Ariel Chamber Ensemble. 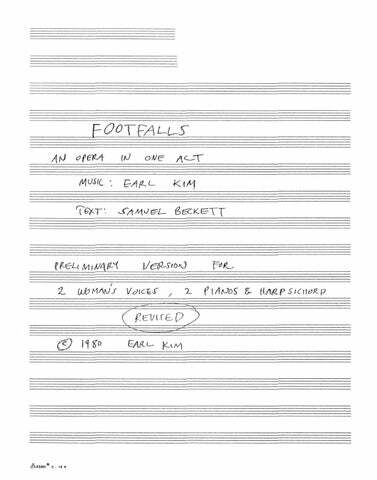 Eh Joe and the one-act opera Footfalls were presented at the Second International Samuel Beckett Festival in The Hague in 1994, where Kim also lectured on the subject “Setting Beckett” and participated in the “Beckett and Music” panel. 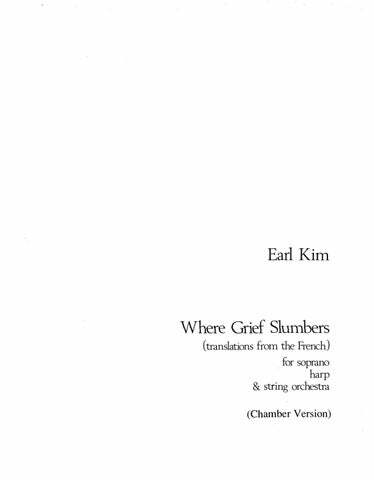 Earl Kim died at his home in Cambridge, Massachusetts, on Thursday, 19th November, 1998, at the age of 78. For Soprano Voice (Singer-Narrator) and Chamber Ensemble 25:00 Sop. Fl./Picc. Ob. Cl. Vln. Vcl. 3Perc. for Piano and Orchestra 11:00 Solo Pno. ; 2(2 dbl. Picc.) 2 2 2 – 2 2 2 0; 2Perc. Str. 22:00 Solo Vln. ; 3(Picc.) 2 3(B.Cl.) 2 – 3 3 3 0; Perc. Cel. Hp. Str. Libretto by the composer, after the play by Samuel Beckett. 23:00 2Pno. Hpscd. …a composer whose music valued economy, precision and quietude, and who was an important mentor to younger composers during a 23-year career at Harvard University. … Kim did the actor’s job, weighing every word exactly and exquisitely. 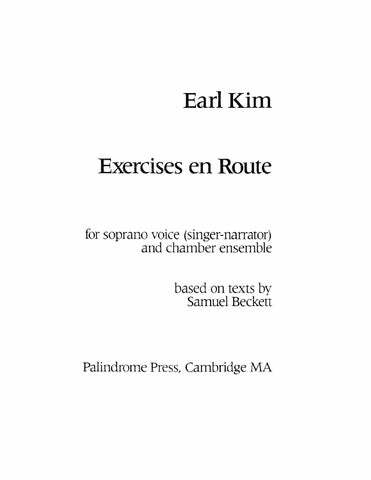 But the master at calligraphic vocal writing was Earl Kim…whose “Now and Then” for soprano and viola/flute/harp trio was performed; this is music of inner-directed beauty and stunning economy of gesture. While many have wanted to write French songs and to ‘enter the world of Debussy.’ few have the ear and the mastery of Mr. Kim, whose settings of familiar poems formed a beautiful and quite fitting conclusion to a rather special evening of music. The “Violin Concerto” is a real gem … there are extended passages in the music of such mesmerizing beauty that you will be transfixed … If you don’t know this concerto, you must. 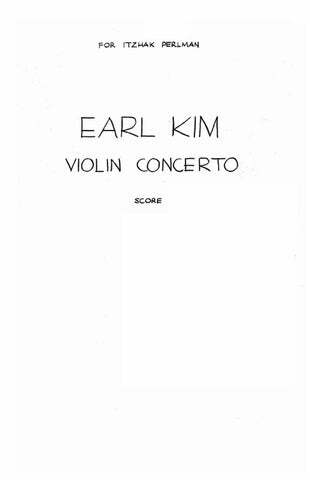 …I must say how much I enjoyed making the acquaintance of Earl Kim’s “Violin Concerto”… It seems to cultivate tranquility and repose rather than the cut-and-thrust of the clasical-romantic concerto… leaves one wanting to explore other works by this composer. A major cycle by Earl Kim…[it] plays upon [Ravel’s] elegance, its passions encoded in a contemporary idiom that sustain the human voice.